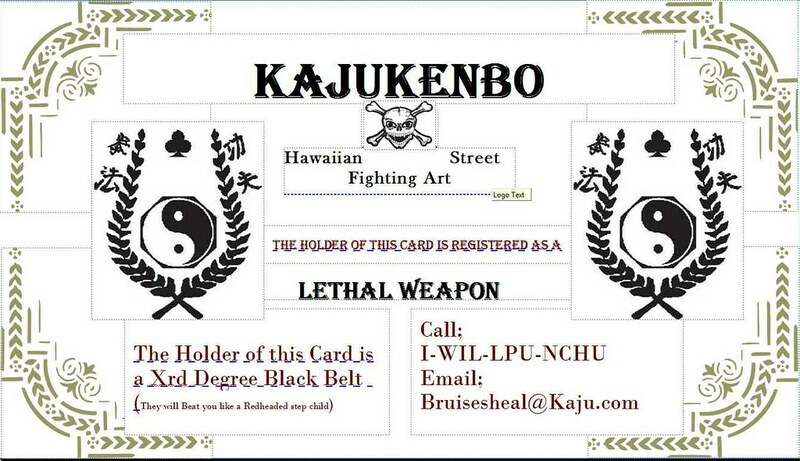 While there doesn't seem to be any validity to the black belt registration requirement, being a black belt or a trained fighter is different in the eyes of the court compared to those with no martial arts background. Generally, there needs to be a weapon used during a fight to charge a person with "ADW" or Assault with a Deadly Weapon. Well, guess what folks? If you are in a fight and the District Attorney elects to press charges against you, one of the charges just may be ADW if they know about you martial arts/fight training background. In essence, you are a deadly weapon! I post this question with all do respect for this forum - but I am very careful and often hesitant to post comments on this forum because of the requirement to list ones true name and affiliation. I fully understand why that rule exists and is enforced here and again I respect that decision. But members should probably be a little extra careful when responding to posts in threads like - What kind of weapons do you carry? and how you would you use them, primary targets. Assault vs. Battery vs. ADW, Mayhem, Aggravated Mayhem, etc. Are you aware any statute or precedent regarding these post being admissible as evidence? I'm not a lawyer, but I could easily see where information you posted on a public forum could resurface in a courtroom. This is a public forum. What you say is out there for everyone to read. I would be very careful not to confess to any criminal activity. Slander is another area where we need to be careful. If someone got on here and said I sold drugs out of my school, I couldn't go beat them down because I'd end up in jail. But I could file a lawsuit against them. The pros and cons of putting your business out there.